Feast on crab, tri-tip, and pasta while supporting Mexico Mission 2019! Tickets are available after worship between now and the crab feed itself. There's a family waiting for us to build them a new home. Your generous support enables us to improve their lives and enrich the lives of our volunteers. Please join us as we lovingly take down and pack away the decorations that graced our sanctuary during Advent. We will start immediately following worship, and we expect to be done in about an hour -- or less, if you come and help! The Worship Ministry Team will be decorating the Sanctuary for the Advent season on Tuesday, November 28 at 6p. If you would like to help make our worship space beautiful for this special season, please join us! We will be ordering pizza for dinner. Please let Andie know if you'll be joining us so we can order enough pizza! Sunday, November 12, will be Rev. Dr. Russ Peterman's final worship service as our Senior Minister, and we truly hope you can come help celebrate his 12 years leading this congregation! After his final worship service at 10am, we will gather in Fellowship Hall at around 11:30am to eat lunch and celebrate all that Russ and his family have meant to us. In order to get an accurate count for the Texas-themed, Kinders-catered lunch, please contact the FCC Concord office (andie@concordfcc.net or 925-685-7503) by Monday, November 6, to let them know how many from your family will be attending. RSVPs are very helpful in planning, but if you can't or forget, please come anyway as we expect to have plenty of food! And if you'd like to help with planning, preparation, or clean up, please contact Denise Schneider (niece1955@hotmail.com). We will observe All Saints Sunday on Nov. 5, when we will honor the "great cloud of witnesses" that have gone before us. This year we're inviting you to bring pictures of people you have loved and lost in the past. During the service you'll be encouraged to hold them close to your heart as we remember their impact on our lives. To help us celebrate this sacred day, our guest preacher will be The Rev. Dr. Mary Donovan Turner. She has preached for us before, each each time receiving high praise and rave reviews. We’ll also be doing several baptisms this Sunday. Over the last 8 weeks a number of our young people have been meeting each Sunday as part of our Baptism & Belonging class, learning about what it means to be baptized and be a part of the community of faith! It seemed fitting to do this on All Saints Sunday, as they too, will become part of the great “cloud of witnesses” who live out our faith and witness to the love and grace of God. Please join us on November 5. The Admin Council is comprised of the leadership of the Administrative Committees and the Executive Committee. This group meets quarterly to conduct the important business of the church. Saturday, October 21, from 8am to noon marks our annual All Hands Fall Church Clean-Up. A lunch will be served to celebrate all the hard work. To aid in the planning for this endeavor, please sign up below. We are thrilled to host this year's Witness Our Welcome, an interfaith worship service that celebrates God's inclusive love of ALL God's children — most especially LGBTQ and their allies. 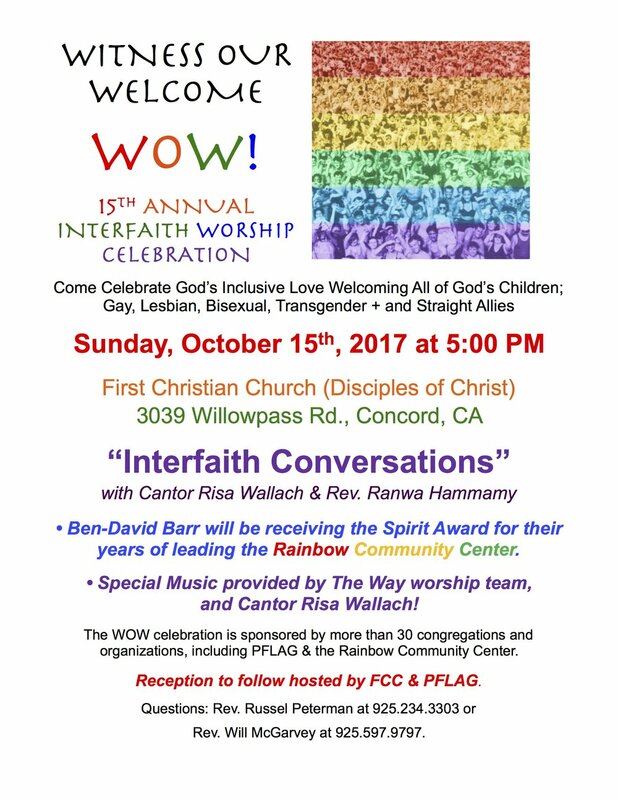 This annual service is put on by the Interfaith Council of Contra Costa County. Speakers at this year's event will be Cantor Risa Wallach & Rev. Renwa Hammamy. Join us on Wednesday nights at the Calicraft Taproom (2700 Mitchell Dr.,Walnut Creek, 94598) for a cold beverage and great conversation. Each of us will be responsible for purchasing our own beverages. This is a chance to give thanks for the special animals in your life! Our cats and dogs, reptiles and horses, fish and birds grace our homes and are among the things we care deeply about. Come join us as we celebrate God’s creation of animals and pets as we gather together to sing, bless, and remember our favorite furry and feathered friends! We’ll also be collecting unopened bags or cans of dog and cat food that will be donated to A.R.F. who will make sure it gets to low income pet owners. Come be a part of an exciting new monthly ecumenical program for children & youth! There will be games, discussion, pizza, and worship! UPDATE: The LAST CHANCE to purchase your tickets for this wonderful event will be THIS SUNDAY, September 24! Get your tickets now! Come one, come all to this fun fundraising & fellowship event. Get your tickets now! Enjoy a delicious 4-course, family-style Italian dinner prepared by Chef Janet Hecker (one glass of wine included with each adult ticket). 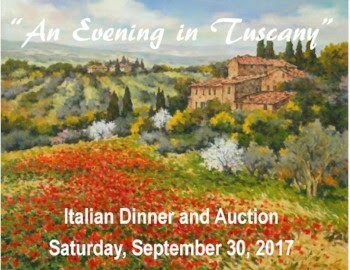 Your participation at “An Evening in Tuscany” will provide much-needed funds for all our church ministries to help First Christian Church “make ends meet” during the last quarter of 2017. Doors open at 5:30 pm. Dinner seating will begin at 6pm in Fellowship Hall. Tickets Prices: $35 for adults; $20 for teens ages 13-17; $10 for children ages 4-12 ($25 max. for 3 or more children). Tickets on sale after church, September 10th, 17th and 24th. Transitions – Why? When? Where? We will have two professionals who will lead our discussion. Our own Marty Appel and his colleague, Realtor, Dayna Wilson. Dayna's chosen specialty is helping boomers, zoomers, and savvy seniors. She is a downsizing diva! As a Senior Specialist, she not only creates customized strategies for marketing and selling a property, but also works with clients and their families to explore housing options. Marty is a Home Equity Retirement Specialist. He is a well-known local expert and speaker on reverse mortgages. With his no-pressure educational approach, Marty is an expert at helping folks find the right solution that exactly meets their needs. Join us for fellowship and information!!!! Bring your lunch, we will furnish drinks and dessert. 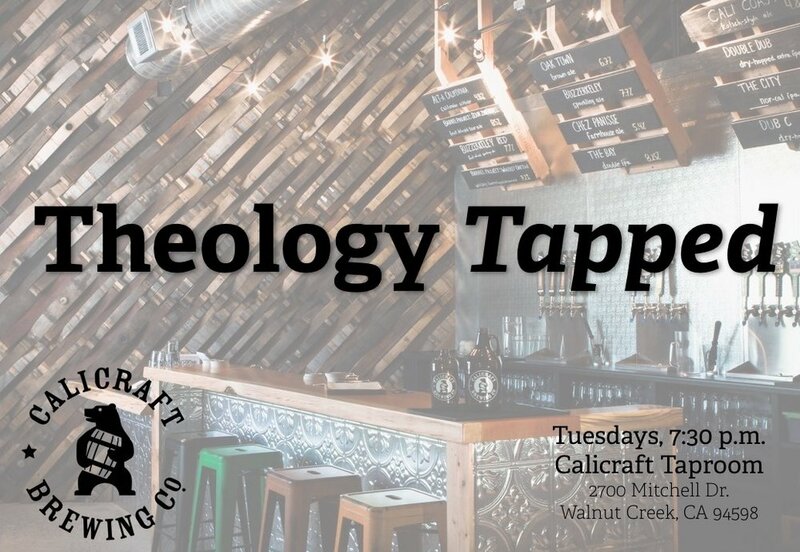 Join us on Tuesday nights at the Calicraft Taproom (2700 Mitchell Dr.,Walnut Creek, 94598) for a cold beverage and great conversation. Tonight's topic: What is ‘Faith’ all about? Join us on Homecoming Sunday, the beginning of a new year of spiritual growth opportunities for children, youth and adults. 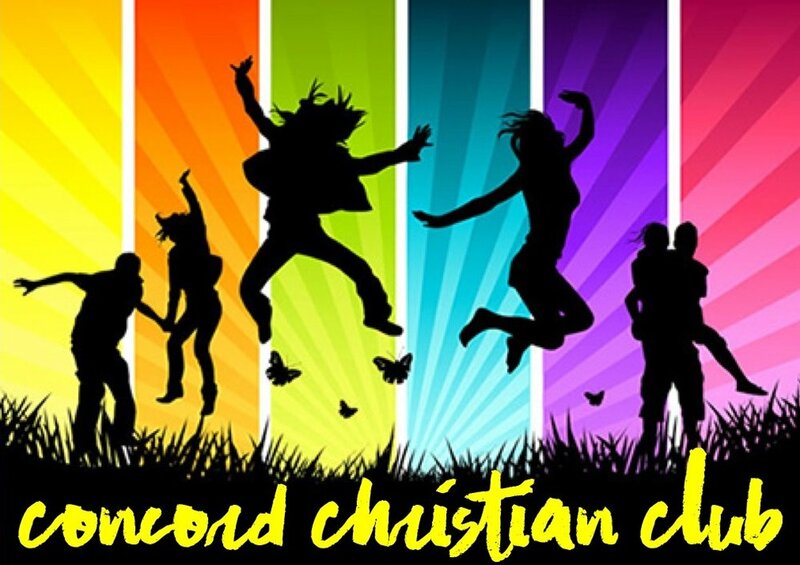 It’s a great opportunity to introduce a friend to the grace-filled community that is First Christian Church, Concord! There will be activities for the kids and a light lunch will be served after the service. There will be games, discussion, worship… and PIZZA! New members of First Christian Church join a congregation with a 130-year history of fostering community and spiritual growth through worship, learning, missions, pastoral care and fellowship. Our Information Seminars, Beginnings, are an opportunity to learn about how this church came to be, our ongoing message of grace, joy and inclusiveness; as well as the many opportunities to get connected and meet other members. All those interested in finding out more about this congregation are invited to join us Monday, August 21 at 6:30 p.m. in the Plambeck Room. A light dinner will be served and there will be plenty to time to ask any questions you may have. Interested? Have questions? Contact Russ Peterman at the church office (russ@concordfcc.net or 925/685-7503) or RSVP by filling out the form below. August is here and a new school year is just around the corner. In anticipation of this we'll be doing a Blessing of the Backpacks in worship on August 20th. We encourage students and educators to bring their backpacks to start the school year with a little extra blessing! Come watch Moana on the lawn! Bring your chairs, blankets and Ohana! Invite your neighbors and friends. This is a great movie for all ages. Popcorn and cool treats will be provided. This event is a benefit for the Outreach Ministry team to serve our community! To purchase tickets, contact Diane Maltester or see one of the Outreach Ministry Team members before or after worship. The Elders of the church gather quarterly for prayer, study and discussion. Join us on Friday, August 4 at 12n in the Plambeck Room! Nicole Howell, Executive Director of Ombudsman Services of Contra Costa County will be speaking. Her presentation will be entitled "Renegade Aging: Person Centered Care." Bring your lunch, share in fellowship and learn more about empowering families and seniors with critical information that will allow them to make critical decisions as they age. All are invited to come hear all about Emily Morgan’s recent mission trip to Cambodia with a group from Northwest Christian University, where she is a student. After worship on Sunday, July 30, we’ll gather together in the Plambeck Room to learn about her experiences working with victims of human trafficking. She’ll share stories and pictures and reflections on how this experience has transformed her.